A brilliant and moving coming-of-age story in the tradition of "Wonder" by R. J. Palacio and "The Curious Incident of the Dog in the Night-Time" by Mark Haddon--this debut novel is written with tremendous humor and charm. This is Alex's story. But he doesn't know exactly what it's about yet, so you probably shouldn't either. It's sort of (but not really) about brain surgery. It's sort of (but not really) about a hamster named Jaws 2 (after the original Jaws (who died), not the movie "Jaws 2"). It's sort of (but actually quite a lot) about Alex's parents. It's sort of (but not really) about feeling ostrichized (which is a better word for excluded (because ostriches can't fly so they often feel left out)). It's sort of (but not really (but actually, the more you think about it, kind of a lot)) about empathy (which is like sympathy only better), and also love and trust and fate and time and quantum mechanics and friendship and exams and growing up. And it's also sort of about courage. Because sometimes it actually takes quite a lot of it to bury your head in the sand. "Irresistible "Ostrich" is loaded with wit, charm, and wisdom. Alex is one of the sweetest and most inspiring narrators I've ever encountered. I dare you not to laugh, cry, and fall utterly in love." --Maria Semple, "New York Times "bestselling author of "Where'd You Go, Bernadette? "One of the bravest novels I've read in a very long time. Matt Greene lets the reader become detective, and clue by clue we uncover not only the truth of Alex's world, but the deepest truths of what it means to love and lose." --Carol Rifka Brunt, author of "Tell the Wolves I'm Home"
""Ostrich" has given me the most enjoyable reading experience I've had all year and has one of the funniest and most engaging young narrators I've had the pleasure of reading. 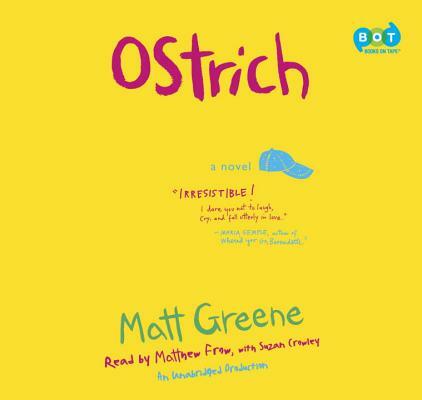 Matt Greene is seriously funny and in "Ostrich" proves comedy can be the finest of arts." --Matt Haig, author of "The Humans"